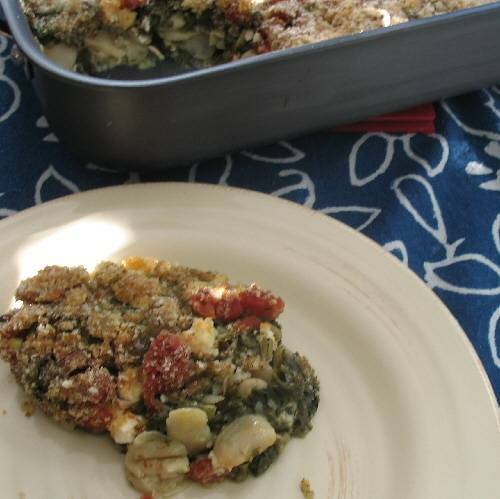 This is a delicious meatless oven casserole that combines the classic tastes of spinach with green onion, leeks, dill, and feta cheese, combined with giant beans (yigandes) or lima beans. 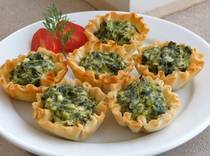 It can also be made with frozen spinach and, when fresh tomatoes may not be available, canned can be substituted. Step 1: Soak the beans in a large bowl of water overnight. The next day, drain and transfer to a large soup pot. Cover with cold water (at least 3 times as much water as beans) and bring to a boil over high heat. When a full boil is reached, reduce heat and cook at a slow boil for 1 hour. Transfer to a colander to drain and set aside. If using frozen spinach, defrost and skip step 2. Step 2: Clean spinach well, trim roots, and discard any damaged leaves. Chop coarsely and put in a large bowl or plastic tub. Step 3: Taking one handful of spinach at a time, squeeze gently but firmly over the sink to remove most excess liquid, and place spinach in a colander. When all the spinach has been squeezed, toss with salt and set aside to drain. Step 4: Prepare remaining ingredients. Step 5: Preheat oven to 340°F (170°C). Oil an 11X14 inch (or equivalent) roasting or baking pan (with 2 1/2 inch sides). Step 6: In a large bowl or plastic tub, combine spinach, onions, leeks, dill, and 1/2 the feta cheese. Toss with hands to mix evenly. Step 7: Distribute 1/2 the spinach mixture evenly over the bottom of the pan. Add the beans to make an even layer, and place the remaining spinach mixture on top. Sprinkle with remaining cheese, then the chopped tomatoes. Sprinkle with pepper. Pour oil over the top, and finish with an even dusting of bread crumbs. Step 8: Bake at 340°F (170°C) for about 1 hour 30 minutes. Time will vary depending on the amount of liquid released by the spinach, so check early and keep checking until the bottom of the pan has just a little oil left.